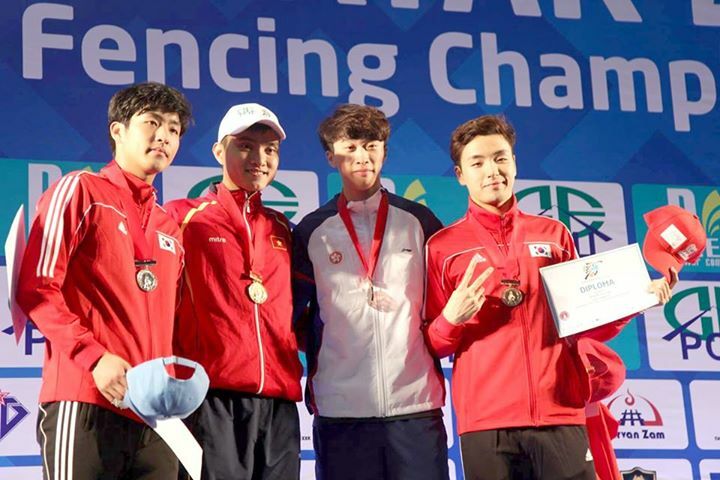 HA NOI (VNS) — Vietnamese fencer Vu Thanh An won a gold medal on Tuesday at the 2015 Asian U23 Fencing Championships in Ulaan Batar, Mongolia. An defeated South Korea's Park Junyeong 15-13 in men's sabre category. An also won gold medal at the SEA Games in Singapore in June. An is expected to compete at the 2016 Olympics in Brazil next summer. Ly Hoang Nam crashed out of the boys' doubles' first round at the US Open's junior circuit yesterday. Nam and his partner, Japan's Akira Santillan, the number four seed, lost to Tim Sandkaulen of Germany and Mate Valkusz of Hungary 1-6, 6-4, 10-12. It is a major defeat for Tay Ninh Province-born Nam in this Grand Slam tournament as he had won the boys' doubles title at Wimbledon in July. Earlier, Nam lost the US Open boys' singles first round to Denis Shapovalov of Canada.